Police searching for a Ross Geller "lookalike" thief believe they have identified the man after being "inundated" with responses. 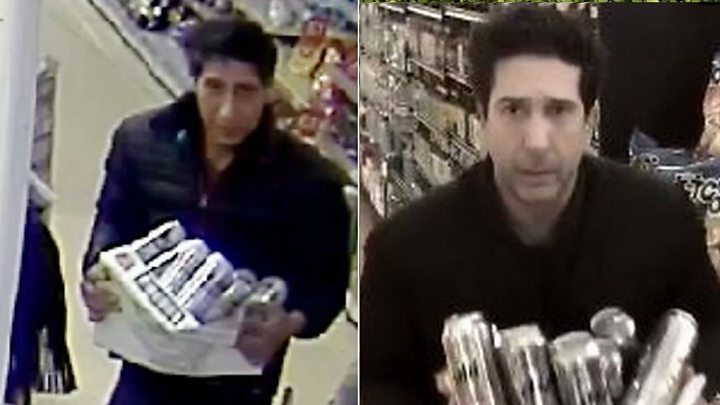 Social media images of the man clutching a crate of beer went viral, and saw him dubbed the "spitting image" of Friends actor David Schwimmer. A Lancashire Police spokeswoman said: "We think we know who he is but we just need to trace him." The man is wanted over the theft of a jacket, mobile phone and wallet. The force tweeted: "Could we BE any more overwhelmed with the response to our CCTV appeal about a theft at a restaurant in Blackpool? "Most importantly, we're now satisfied we've identified the man in the still and our inquiries are very much continuing. Huge thanks for sharing it with your Friends." Schwimmer responded to jokes posted on Blackpool police's Facebook post with a video on Wednesday. In the clip posted to Twitter and Instagram, the star was seen furtively glancing at a camera as he walked through a convenience store clutching cans of beer. "Officers, I swear it wasn't me," he said in an accompanying post. "As you can see, I was in New York. To the hardworking Blackpool Police, good luck with the investigation." Police had earlier confirmed Schwimmer was not in the UK at the time of the offence, but the original post descended into something of a Friends quote-fest, attracting 133,000 comments referencing the show. The force appealed for anyone with brand new information about the theft, which took place at Mr Basrai's restaurant, to contact them. The suspect is wanted for the alleged theft of a jacket, wallet and mobile from the restaurant on Talbot Road on 20 September. Police released the CCTV image of the suspect buying beer from a shop.